Yesterday the Second Circuit held arguments in the Argentina sovereign debt case. This case is ... I mean, you kind of had to be following along, but quick summary: back in the day Argentina defaulted on some old bonds, and exchanged most of them at a discount into new bonds, which it&apos;s been making payments on. 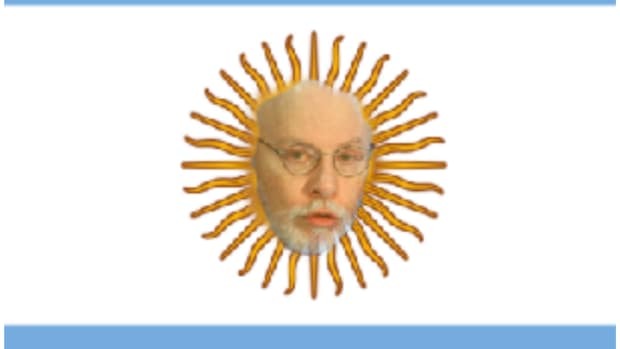 Elliott Management bought a bunch of old bonds, which Argentina has not been making payments on, and sued Argentina to make them pay the old bonds pari passu with the new ones. Elliott won in a lower court, and then sort of won on appeal, and then Argentina raised some mind-meltingconsequences in the lower court, and then Elliott won again anyway, and now it&apos;s back up on appeal again, and the oral arguments were yesterday. Also there&apos;s a boat. “We are representing a government, and governments will not be told to do things that fundamentally violate their principles,” Jonathan Blackman, a lawyer for the deadbeat South American country, told a Manhattan US appeals court. “So the answer is you will not obey any order but the one you propose?” Judge Reena Raggi asked. “We would not voluntarily obey such an order,” replied Blackman — who later said Argentina would be no more likely to obey a US court than the US would be to obey an Iranian court. If you get to choose whether or not to obey it, it&apos;s not so much of an order. It&apos;s good to be a sovereign. I mean, it&apos;s not great; as Felix Salmon says, "Argentina remains a capital-markets pariah, it can’t really do business anywhere in the world without worrying that Elliott or someone like it is going to attach its property, and pretty soon it will probably have to give up on issuing any foreign debt at all." Argentina doesn&apos;t pay bonds, causing a credit event. Argentina launches its exchange offer, and some people exchange into perfectly good Argentina-law bonds. But some people hold out a few New York law bonds and do not exchange them. The CDS settles, based on the price of New York law bonds, which - because they will never be paid - are worth roughly nothing. This is a possibility I guess? The other possibility, which seems more likely to my untrained eye, is that the CDS auction will occur after a payment default but before the exchange goes through, so the price of New York law bonds will still reflect - as they currently do - the likelihood of their one day becoming more attractive Buenos Aires bonds. CDS was built on the [assumption] that upon default all deliverable bonds trade at the same price. The real-world justification for that assumption was that in a Bankruptcy, everybody accelerates their bonds and pretty much has a par claim that will be treated similarly. But for Restructurings and for Sovereigns, that assumption is obviously invalid. Hence, all the disputes you see relate to Restructurings and Sovereigns.2 Once the CTD [cheapest-to-deliver] option is so valuable, you get huge fights about what is or isn’t deliverable and what does or does not constitute an event – because an event creates huge potential windfalls relative to bond positions. Anyway. Some flavors of the bond/CDS disconnect here can be - or, at least, could have been - avoided by ISDA&apos;s plan to one day have a sensible treatment of "exchange property" (as equity people put it) in CDS contracts.5 Some of them can&apos;t be: in particular, the cheapest-to-deliver option is a key feature of CDS, making it more liquid and general-use than just a hedge to a specific bond issue. It&apos;s not a bug, it&apos;s a feature. Or I mean, it&apos;s somewhat bug-like, but it&apos;s a necessary bug. One perception of ISDA, who make the rules on these things, is that it is dominated by dealer banks who err on the side of not paying out on CDS because dealers tend to write more CDS than they buy. (This may not be true!) Thus when the Greek default looked likely to hose CDS holders, there was much complaining by holders about how unfair that was and what meanies ISDA were. (It worked out fine in the end.) There&apos;s been much less complaining here, since it looks like CDS holders are more likely to get a windfall than a hosing on Argentina&apos;s rapidly approaching default. I wonder if that also means that the rules are more likely to change to reduce such windfalls in the future. 1.Buy the package! Pay ~$120 up-front, get a $9 coupon, pay a $5 coupon on the CDS, and get back $100 in five years. At a zero discount rate that works out perfectly. Oh, unless there&apos;s a default. 2.There&apos;s a whole mishegas of maturity buckets in Sovereign Restructurings to partially address this, but they apply to restructurings, not payment defaults. This seems harsh to me. Argentina have been pretty clear that they&apos;re not going to pay Elliott, and will default on the exchange bonds instead. So, like, why shouldn&apos;t Elliott be allowed to bet on a default on the exchange bonds? It may be the only way for it to get paid for its efforts. I&apos;d certainly be buying CDS if I were them. Guess that would&apos;ve made the court date kind of awkward though. This could get even screwier if Arg tries to use Collective Action Clauses to change the terms of the bonds to be local law, local payment. Most bondholders just want to get paid, so they might well constitute a majority for a CAC. Now, maybe this is not even possible because it violates the order. But if it is possible, and it gets done for some or all bonds, then these bonds might be rendered non-deliverable. If the CACs are used before a technical default, then you would wind up with a potentially small deliverables list. Oh, yes, and also a debate about whether change of law via CAC is a Restructuring Event under CDS. 5.Viz., "if a bond poofs into other stuff, the CDS deliverable is one bond&apos;s worth of the other stuff." This doesn&apos;t quite handle voluntary exchanges. One common approach in equity contracts is to say "if holders of the reference security are offered a choice, the reference security becomes whatever choice most of them take." There&apos;s a certain logic to that: if 90% of the NY law bondholders take local-law bonds, maybe the CDS should reference those bonds.